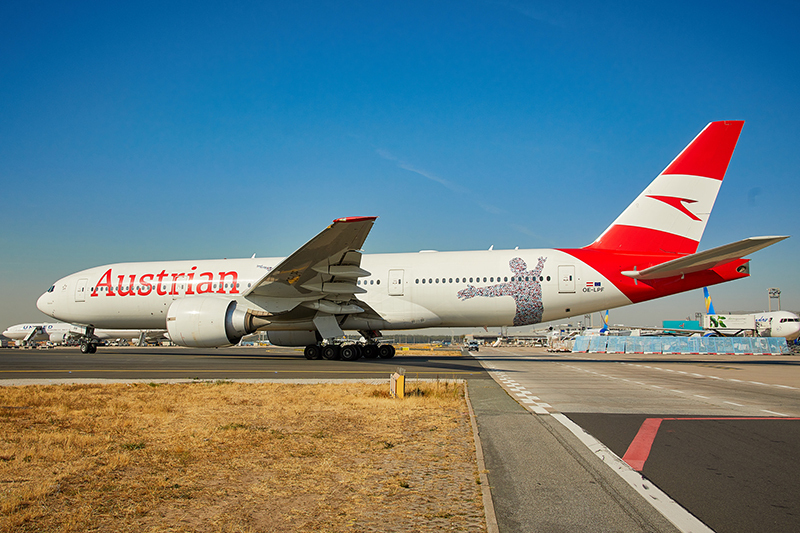 VIENNA - Austrian Airlines (AUA) is the smallest long-haul airline within the Lufthansa Group with twelve aircraft in this segment, one half being Boeing 767s, the other 777s. The motto "small is beautiful" fits AUA perfectly. Me and many frequent fliers consider their inflight product to be the jewel of the crane collection. No other airline within the Lufthansa Group succeeds to charge its product with such a distinct national identity in an equally masterful way and on such a high level. On this Saturday morning I go first to the Business Class lounge in Vienna briefly, which however slightly disappoints. It is very crowded, there is just one toilet and it’s not even signposted, on the morning buffet there is just jam to be put on the bread offered and all foreign newspapers are from the previous day, though it’s mid- morning. In this category Lufthansa does better. I am on my way today to join the inaugural AUA flight from Vienna to Cape Town. Just the fact that this is a seasonal route served twice weekly until Easter 2019 with an outbound daytime-flight clearly indicates that this is a predominantly touristic route. The hubbub at the gate and departure from a remote position of Vienna airport brings that point across all the more – there is even a very realistic elephant figure, actually run by two humans inside, giving passengers a farewell next to the aircraft. The Boeing 777-200ER named “Sibanye” (meaning roughly “We are one”) is the only aircraft sporting the newly revised livery at the time, dominated by the bold “Austrian” branding over the whole forward fuselage plus some special stickers for the 60 th AUA anniversary. At the same time this aircraft, in service since early 2018, is AUA’s newest 777, which still means it was built in 2001 and flew with Varig and Aeromexico before. The interior, however, appears to be brand new and the Business Class cabin looks pristine. The staggered “Vantage” seats made by Thompson Aero Seat are physically the same as in some aircraft operated by Brussels Airlines, Finnair, Swiss, Delta and American. Visually AUA can score on first sight with stylish blue-grey seat covers and cleverly set contra-points in dark red on headrests, reading lamps and stowage pockets. In total AUA’s 777 offers 40 seats in Business Class, seven rows in either 1-2-1 or 2-2-2 configuration in front of the galley and an eighth row in 2-2-2 layout behind. The most coveted seats for passengers traveling alone like me are the single “throne” seats of which there are just six in total. Mine is 3K. 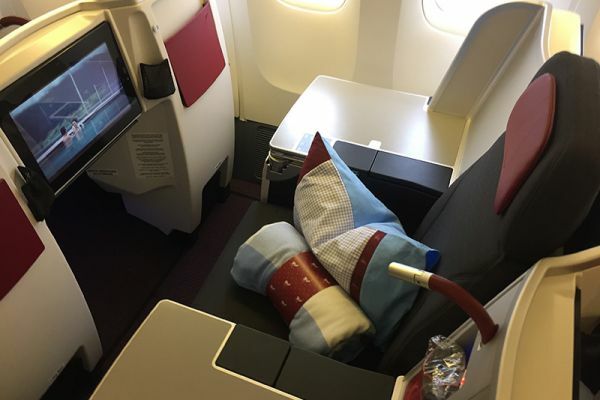 I really like the huge table-like monuments on each side of the seat, on top of which a big pillow and a high-quality blanket have been placed, both coming in a smart light blue/white/dark red design. The cover of the leather-made seat pocket on the back wall of the shell even sports an embroidered fantasy crown, very fitting for the throne, though this application can be found on all seats. What becomes clear is that AUA exudes the air of high quality even in small things. 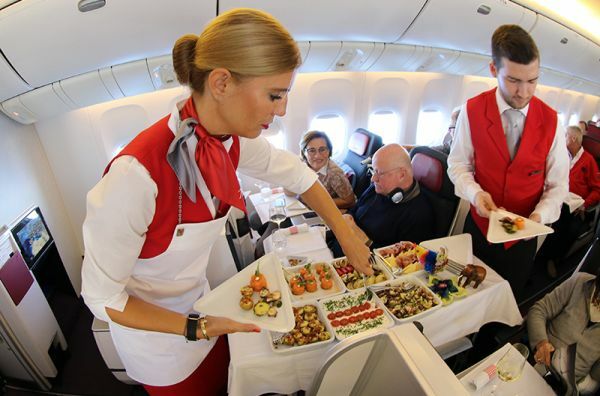 Before take-off, besides the cabin crew in their bright red uniforms - a welcome visual accent - the inflight chef of caterer Do&Co appears, wearing his characteristic cap. The only other airline doing this is Turkish Airlines, which is catered by the Istanbul affiliate of Do&Co. This is of course also a show element, but in terms of inflight catering nobody can really match AUA, and part of this is the chef, even though of course he can’t really individually prepare meals in the galley. Business Class on this inaugural is as packed as the whole aircraft. Making it even more comfortable to be in the throne seat where nobody physically intrudes on your living space. At 11.31am we rotate in Vienna, 16 minutes behind the scheduled departure time. When we are over the Med heading towards Sardinia it becomes clear that this is not an ordinary flight. An Austrian winemaker is on board who produces wine both in Austria and at the Cape. He announces to Business passengers a wine tasting of no less than six different vintages having been specifically catered for this flight, as well as big full-size red wine glasses, one for each passenger, from which to taste all wines. Problem is you can’t just spit out any leftovers but basically have to drink all to then taste the next wine. Which is definitely great taste-wise but makes it more difficult for me to get the work done I had earmarked for this flight. After the wine tasting started also the food service commences, its kickoff is the biggest spectacle I know at any airline, just Do&Co does this at AUA and Turkish: The antipasti cart. It looks terrific and the dishes taste equally terrific. Six different kinds of antipasti, mouth-wateringly arranged, are coming by, a feast for the eyes. Enhanced by the uniquely triangular-shaped china it is served on, formerly a trademark of Lauda Air. My favourites are the filled potatoes and the octopus salad. For the main course there are three choices: Viennese style veal goulash (which finds most takers), rigatoni pasta or seafood brochette. I order the latter and it is highly satisfying, again looks and tastes stunning. With it I go for a glass of champagne (Duval-Leroy Brut Réserve), a good contrast after the wine tasting. Usually AUA offers three red and three whites, all from Austria, naturally. And no question that the Austrians also offer tempting desserts: Apricot dumplings, plum ragout with curd cream or hazelnut parfait. I ask for the frozen parfait and it is outstanding. With it I need an Austrian apricot brandy as digestif, yummy. But that should have been it. Or not? Now another AUA specialty comes out: The “Vienna Coffee House above the clouds” with its very own menu card. No less than ten different specialty coffees can be freshly prepared in Viennese style, chapeau! Three of the offerings contain alcohol. I am almost relived I don’t drink coffee in general, but I have to admit what my neighbours get served looks tempting in tall glasses with lavish tops of whipped cream. Eleven hours of day flight can be long, so it’s time for an afternoon nap. I extend my seat to full bed position. Officially seat pitch here is a meagre 152cm (60’’), the width of 50cm isn’t huge either. But fact is one can stretch out significantly below the seat in front, the little foot well is even bluely lit. Many users criticize that they feel like lying in a coffin in the throne seat due to the proximity to the floor und what then become high walls on all sides. But I can only partially agree, even measuring 1,88 meters. Of course, with shoe size 46 (11.5 US) the foot space can always be bigger, but in the current Lufthansa Business Class seat tightness at the foot end bothers me much more. Also, the double seats in AUA’s product offer a bit more of it, if you care. I at least can very comfortably hold a longer siesta here. It is not a top score AUA gets with the IFE content offered, supposedly 300 hours in total. Which is not much compared to many other airlines, where 1,000 hours are fairly normal these days. There a very few audio albums (only 73, among them just four for rock and three for soul/jazz) and 69 movies, few current ones. Even I, that I usually only use the audio offerings and rather read than watch movies, feel the limited content, especially after having just flown on Emirates and Singapore Airlines who both are leading in this field. A big minus for AUA, especially on a day flight and compared to the just mentioned competitors but also its mother Lufthansa, is the total lack of Wifi on all long-haul routes. Currently there are not even plans to change that in the mid-term future. This could be a reason for business travellers not to take AUA for long haul. Very late, only at about 9pm (there was no time difference between Vienna and Cape Town that day) the second meal is served. The choice is between beef strudel or chicken quesadillas, which I opt for. The chef brings them hot, straight from the oven, to the seat and repeatedly gets another helping. And it’s eaten with sour cream and guacamole. What shall I say, delicious! Another culinary hit. After eleven hours and eight minutes we land on time at the Cape. 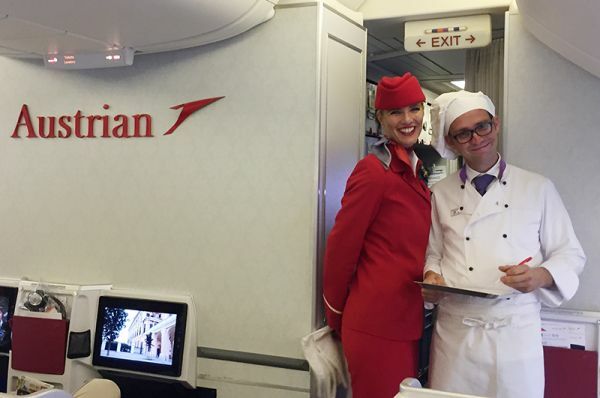 Austrian Airlines offers undoubtedly the best long haul Business product within the Lufthansa Group. 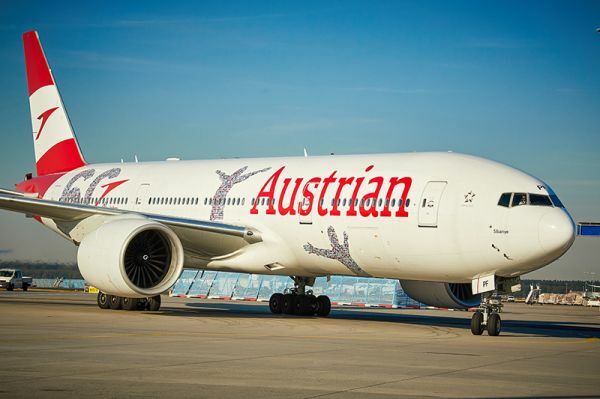 The Austrians succeed in converting their national strengths into a compelling passenger offering. 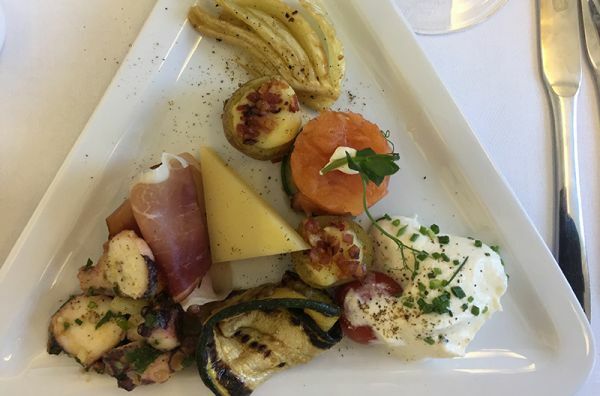 The inflight catering surpasses that of some world-class airlines in First Class in delivery and quality, I know concrete examples from recent experience where this is the case. One shortcoming AUA has to overcome to remain competitive is the lack of Wifi on long-haul routes, also the IFE should offer a bigger array of and more current content.